For over a decade, gamers from all over the world have come together to give back to those who need it most. 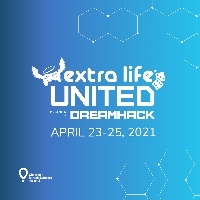 Through the 5th Annual Extra Life United event, Twitch and Children’s Miracle Network Hospitals are gathering charity gamers in support of sick and injured kids. Join us virtually at Coronado Springs Resort at Walt Disney World to learn from some of the best charity gamers out there, and watch as 300 people compete to win up to $150,000 for their local children’s hospital. Throughout the stream you'll get to meet some of the kids and their families who need your support now more than ever.